Once home to the Newmarket Post Office, 141 Main Street is a mixture of businesses and apartments in the center of Newmarket. 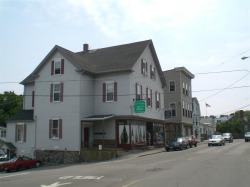 It has three two-bedroom apartments, retail store front on the Main Street level, and two offices spaces on the Water Street level. There are currently no open units at 141 Main Street.